49. With a hymn composed in the eighth or ninth century, thus for over a thousand years, the Church has greeted Mary, the Mother of God, as “Star of the Sea”: Ave maris stella. Human life is a journey. Towards what destination? How do we find the way? Life is like a voyage on the sea of history, often dark and stormy, a voyage in which we watch for the stars that indicate the route. The true stars of our life are the people who have lived good lives. They are lights of hope. Certainly, Jesus Christ is the true light, the sun that has risen above all the shadows of history. But to reach him we also need lights close by—people who shine with his light and so guide us along our way. 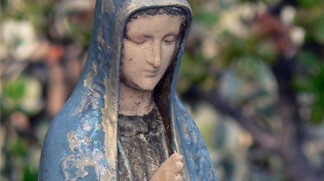 Who more than Mary could be a star of hope for us? With her “yes” she opened the door of our world to God himself; she became the living Ark of the Covenant, in whom God took flesh, became one of us, and pitched his tent among us (cf. Jn 1:14). 50. So we cry to her: Holy Mary, you belonged to the humble and great souls of Israel who, like Simeon, were “looking for the consolation of Israel” (Lk 2:25) and hoping, like Anna, “for the redemption of Jerusalem” (Lk 2:38). Your life was thoroughly imbued with the sacred scriptures of Israel which spoke of hope, of the promise made to Abraham and his descendants (cf. Lk 1:55). In this way we can appreciate the holy fear that overcame you when the angel of the Lord appeared to you and told you that you would give birth to the One who was the hope of Israel, the One awaited by the world. Through you, through your “yes”, the hope of the ages became reality, entering this world and its history. You bowed low before the greatness of this task and gave your consent: “Behold, I am the handmaid of the Lord; let it be to me according to your word” (Lk 1:38). When you hastened with holy joy across the mountains of Judea to see your cousin Elizabeth, you became the image of the Church to come, which carries the hope of the world in her womb across the mountains of history. But alongside the joy which, with your Magnificat, you proclaimed in word and song for all the centuries to hear, you also knew the dark sayings of the prophets about the suffering of the servant of God in this world. Shining over his birth in the stable at Bethlehem, there were angels in splendour who brought the good news to the shepherds, but at the same time the lowliness of God in this world was all too palpable. The old man Simeon spoke to you of the sword which would pierce your soul (cf. Lk 2:35), of the sign of contradiction that your Son would be in this world. Then, when Jesus began his public ministry, you had to step aside, so that a new family could grow, the family which it was his mission to establish and which would be made up of those who heard his word and kept it (cf. Lk 11:27f). Notwithstanding the great joy that marked the beginning of Jesus’s ministry, in the synagogue of Nazareth you must already have experienced the truth of the saying about the “sign of contradiction” (cf. Lk 4:28ff). In this way you saw the growing power of hostility and rejection which built up around Jesus until the hour of the Cross, when you had to look upon the Saviour of the world, the heir of David, the Son of God dying like a failure, exposed to mockery, between criminals. Then you received the word of Jesus: “Woman, behold, your Son!” (Jn 19:26). From the Cross you received a new mission. From the Cross you became a mother in a new way: the mother of all those who believe in your Son Jesus and wish to follow him. The sword of sorrow pierced your heart. Did hope die? Did the world remain definitively without light, and life without purpose? At that moment, deep down, you probably listened again to the word spoken by the angel in answer to your fear at the time of the Annunciation: “Do not be afraid, Mary!” (Lk 1:30). How many times had the Lord, your Son, said the same thing to his disciples: do not be afraid! In your heart, you heard this word again during the night of Golgotha. Before the hour of his betrayal he had said to his disciples: “Be of good cheer, I have overcome the world” (Jn 16:33). “Let not your hearts be troubled, neither let them be afraid” (Jn 14:27). “Do not be afraid, Mary!” In that hour at Nazareth the angel had also said to you: “Of his kingdom there will be no end” (Lk 1:33). Could it have ended before it began? No, at the foot of the Cross, on the strength of Jesus’s own word, you became the mother of believers. In this faith, which even in the darkness of Holy Saturday bore the certitude of hope, you made your way towards Easter morning. The joy of the Resurrection touched your heart and united you in a new way to the disciples, destined to become the family of Jesus through faith. In this way you were in the midst of the community of believers, who in the days following the Ascension prayed with one voice for the gift of the Holy Spirit (cf. Acts 1:14) and then received that gift on the day of Pentecost. The “Kingdom” of Jesus was not as might have been imagined. It began in that hour, and of this “Kingdom” there will be no end. Thus you remain in the midst of the disciples as their Mother, as the Mother of hope. Holy Mary, Mother of God, our Mother, teach us to believe, to hope, to love with you. Show us the way to his Kingdom! Star of the Sea, shine upon us and guide us on our way! This entry was posted on 7 July, 2009 at 11:38 pm and is filed under 73730. You can follow any responses to this entry through the RSS 2.0 feed. You can leave a response, or trackback from your own site.